Who won the MaTe poster contest? only in consultation with the publisher. to each other. I.e. open door culture. Events are volatile, a Live Magazine remains. but every group has its own focus. quality of presentations is very high. 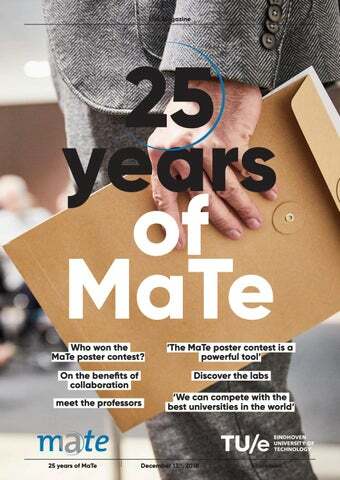 the 25 years of MaTe event. provost (Rector Magnificus) of the university. What is your experience with MaTe? From 108 posters to 10 pitches More than 100 researchers prepared pitches for MaTe’s annual poster contest. Only 10 could actually pitch for the win. And the finalists are… Reviewing 108 posters wasn’t easy, says chair of the jury Jaap Schouten (NWO/ TU/e). “Materials Technology at TU/e is world class. In the past 25 years, MaTe has had a big impact not only on the industry, but also in society. The high quality MaTe delivers was emphazised by the posters we saw.” Together with his colleagues Michel van Bruggen (Philips Research) and Bert van Haastrecht (M2i), Jaap judged the posters based on four criteria: General attractiveness, accessibility, presentation and whether the information on the poster made sense. “A poster should invite you to start reading, and after that, what you read must be logical,” Jaap explained before announcing the finalists. Tim van Nuland with his poster ‘Microstructural modelling of large scale additively manufactured metals’; Aysegul Dede-Eren with her poster ‘A tendon story: Episode I: “May the Force Be With You”’. Each of the finalists gets three minutes for his or her pitch. After that, the jury retires to make its decision. Who will win? Continue reading! Tim van Nuland! Jury prize “Pitching in science is something else,” jury member Michel van Breggen said before announcing the jury’s choice. “You need to attract attention and be concise at the same time. After quite some discussion, we chose a poster with an original layout and a pitch that was both original and intriguing, that showed us that science can be fun and light-footed. The award for best poster goes to Aysegul!” The aim of Aysegul’s research is to understand through which biological pathways mechanical stimulations regulate tenocyte shape and function. Audience prize Tim van Nuland’s poster got the most votes from his fellow researchers. The aim of his research is to obtain a novel structure-property relationship for products made with large-scale deposition techniques based on computational modelling. Congrats Aysegul and Tim! Please don’t forget to be proud when walking through the MaTe Poster Hall of Fame. Cardiovascular Biomechanics The aim of the Cardiovascular Biomechanics research is to develop computational models, experimental techniques, and medical devices for clinical diagnosis, decision support, and intervention. Research is performed along three lines: ‘Blood in Motion’ focuses on the development of mathematical models that simulate blood flow to obtain insight into the occurrence of vascular diseases and to assist in patient specific intervention planning. ‘Heart at Work’ is aimed at assisting in clinical decision making on the basis of mathematical and experimental models. The former enables translation of clinical information on cardiac function into information on the mechanical, electrical, and metabolic state of the tissue. The latter allow for testing of devices and hypotheses in an accessible and controllable environment. ‘Vessels under Stress’ aims to develop clinical measurement techniques to assess the mechanical and morphological properties of the arterial wall, and to use computational models to predict the development of vascular disease and outcome of clinical intervention. platform. To catalyze introduction of new techniques into the clinic, a complete section of PULS/e is dedicated to in vivo measurements. Setups for acquisition in rest or in exercise are available, respecting both privacy and safety of the volunteers and/or patients. The computational and experimental work as well as the ultrasound and photoacoustic imaging activities performed in the Cardiovascular Biomechanics group are mainly applied to give answer to questions that arise in the diagnosis and treatment of cardiovascular diseases such as coronary artery disease, aortic aneurysms, carotid artery disease, heart failure, and heart valve disorders. The research may also focus on the better understanding of specific circulatory physiology as can be found in exercise, perinatal applications, intensive care. Finally, research is performed aimed at the development and optimization of medical devices and instrumentation, extracorporeal systems, and cardiovascular prostheses. Soft Tissue Engineering and Mechanobiology The mission of the group is to conduct research on the biomechanics, mechanobiology, and engineering of soft biological tissues, organs, and their components; and to provide a stimulating educational environment for graduate and post-graduate students. We aim to understand and predict how mechanical factors influence tissue growth, remodeling, damage, and repair, in order to (re)build soft tissues and organs, and to prevent mechanically-induced soft tissue degeneration. Research themes include: cardiovascular tissue engineering, the biophysical cellular niche, tissue and organ morphogenesis, computational modeling of soft tissue regeneration, scaffold design, and skin and fat mechanics. Emphasis is given to the integration of computational modeling with experimentation at length scales from molecule to man. students are available in the Cell and Tissue Engineering lab. This is a shared research facility that combines standard cell and tissue culture technologies with molecular/ cell/tissue analysis, cell and tissue mechanical characterization, cell transfection, life imaging, in house developed bioreactors and microtissue platforms, and scaffold manufacturing (spinning, printing) and testing technologies. In addition, the group houses a fully equipped microscopy facility with advanced fluorescent microscopes and dedicated confocal microscopy set-ups for on-line and prolonged monitoring of living cells and tissue. Through its collaborations within MaTe and with the Institute for Complex Molecular Systems, the group has access to the laboratory for Biomechanics, the Materials Engineering facility, the Microfabrication Lab, and the Immuno-engineering facility. development of well-defined in-vitro model systems of tissue growth, adaptation, regeneration and degeneration. Tissues of principle interest are heart valves and small diameter arteries, while new research lines concentrate on biomaterial-driven regeneration of organ functions (heart, kidney, cornea). Soft tissue biomechanics. This line of research is aimed at understanding the influence of mechanical loading on damage and adaptation of soft tissues. An important application area is the investigation of the etiology of pressure ulcers, with the ultimate goal to identify risk parameters and, in particular, early markers of tissue damage. These markers can be used in biosensors or as leads for bio-molecular imaging. A second research line is focused on the mechanical properties of the top layers of the skin, to understand the interaction of skin with sensors, personal care applications and devices used for transepidermal drug delivery. To translate our fundamental knowledge to (bio)medical applications we actively collaborate with clinical partners, industry, and patient organizations, mainly in publicprivate-patient partnerships (PPPPs). Mechanics of materials The Mechanics of Materials group focuses on the design, manufacturing and analysis of a variety of mechanical components, devices and structures, involving a variety of hightech materials across a broad range of length scales. The mechanical performance is analysed and optimized in terms of the material’s constitution and composition, whereby tailored microstructures give tailored properties. The group’s research portfolio embraces both experimental, theoretical and computational mechanics. The group’s expertise builds on core disciplines like Solid Mechanics, Damage Mechanics, Fracture Mechanics, Computational Non-linear Mechanics, Materials Science. The research spans a variety of materials, including metals, composites, ceramics, paper, textiles, biogenic hybrid materials. Automotive: In automotive applications, the research in Mechanics of Materials relates to the performance of materials in crash situations, in harsh environments, such as engine components, tires, powertrains, or sensors and actuators. 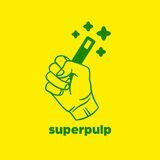 for nuclear fusion reactors and efficient battery systems for energy storage. Materials technology: Focus is here given on dynamical metamaterials and mechanical metamaterials, allowing to mitigate wave propagation in solids or trigger unique mechanical properties. The Multi-Scale lab of the Mechanics of Materials group takes a rather unique position as it bridges the gap between traditional materials science and mechanical characterisation, by integrating mechanical testing with (real-time and in situ) microscopic observation. With a focus on developing novel (miniature) testing devices and strategies, the lab allows for quantitative in situ microscopic measurements during deformation and mechanical characterisation of a broad class of materials, structures, MEMS etc. on a wide range of length scales from nanometres to centimetres. The lab perfectly fits in the research group’s mission, and enables a symbiosis between computational modelling and advanced experimentation across the scales. of microsystems, where especially hands-on practical teaching in the lab is an important aspect. micromanufacturing technologies for use in life sciences applications. We develop innovative technological concepts and fabrication methods for a wide range of applications, often in collaboration with industrial partners like Philips, ASML, and Micronit, and also with biomedical and clinical partners, like Erasmus MC and Maastricht UMC. Concrete applications of the section’s research range from organ-on-a-chip systems for cancer and brain research, pointof-care diagnostics, medical devices, wearable health sensors, water and air quality monitoring and purification, lithography machines, displays, and brain-inspired computing, to soft microrobotics. Orthopaedic Biomechanics Musculoskeletal tissues are produced, maintained and adapted by cells as a response to their biophysical environment in health and disease. Of the latter, degenerative diseases have become more prevalent with an increasing socioeconomic impact in our everaging population. With increased longevity and a higher level of activity, current treatment methods with purely synthetic devices may be limited. Thus, our research mission is to expand our understanding of the biomechanical function of musculoskeletal tissues as well as their adaptive developmental and physiological nature and then to apply this new-found knowledge to explore and develop new treatment strategies. Our educational mission is to provide teaching in biomechanics/ mechanobiology, regenerative/ tissue engineering as applied to musculoskeletal system based on continuum mechanics, cell biology, anatomy/physiology and pathology. The multi-disciplinary research is carried out in several laboratories which we help to manage. In vitro work is done in the Cell and Tissue Engineering Lab where cells and tissues can be: transfected, differentiated and grown; on selfdesigned and produced scaffolds; in bioreactors and micro-tissue platforms; and analyzed molecularly, chemically, and structurally with advanced microscopy. Tissues can also be conditioned, monitored and characterized in the Biomechanics Lab with Micro-CT imaging and custom-designed mechanical fixtures. bone and apply this to the treatment of fractures or osteoporosis. These methods are also combined with long-term in vitro culturing of tissue engineered bone to understand its complex remodeling processes and to advance the treatment of bone reconstruction. Unlike bone, cartilage does not self-repair, often resulting in osteoarthritis. Here we explore the role of damage accumulation on its ultrastructure and also how we can regenerate it to return painfree function of joints. Similarly, the unique development, structure and physiology of discs are leveraged to create new regenerative and repair treatments for disc degeneration, and the mechanobiological environment is manipulated to improved structure and function of healing or reconstructed tendons/ligaments. Polymer Technology The mission of the group is to provide education on and conduct research in the broad area of Polymer Technology, i.e. the industrial arts of manufacturing of polymer-based products. Design of polymer products and shaping processes benefit from a change from experimental trialand-error to quantitative predictive capability. The main objective is to provide knowledge and models for the prediction and understanding of structure development during processing and the resulting final properties of polymeric products. These properties are determined by intrinsic (molecular) material parameters and, to a great extent, by the processing conditions. fundamental work on soft matter, polymer solutions, and melts. Polymers are vital for energy, environment, and health. Polymers are mainly characterised by their low density, ease of processing and shaping, possibilities of functional integration, and an almost unlimited flexibility in molecular design. Moreover they are in most cases relatively cheap. These characteristics determine not only the societal needs for improved polymer systems in a multitude of application areas like protection, isolation, transportation, communication, illumination, packaging, shielding, housing, furniture, clothing etc., but also set the resulting scientific challenges.